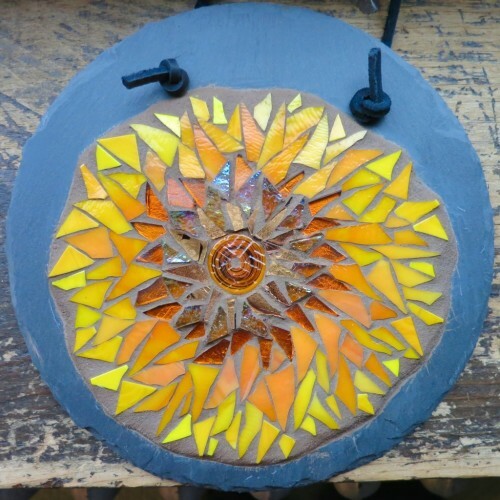 Sunflower Mandala by Margaret Almon. Glass on slate, 7 inches, $96. SOLD. 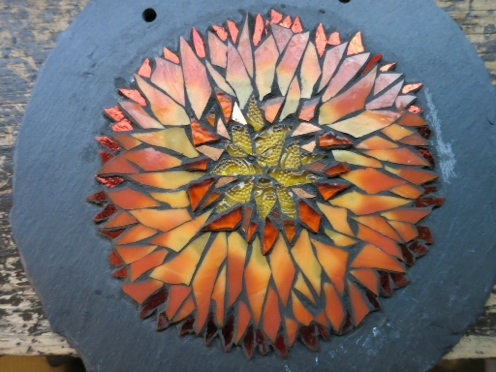 This was to be a yellow sunflower, but the orange slipped in. Yellow is pliable and molds into orange easily. The days are going to get longer now that the Winter Solstice is here. The sun will slip into the darkness and intertwine night into day. 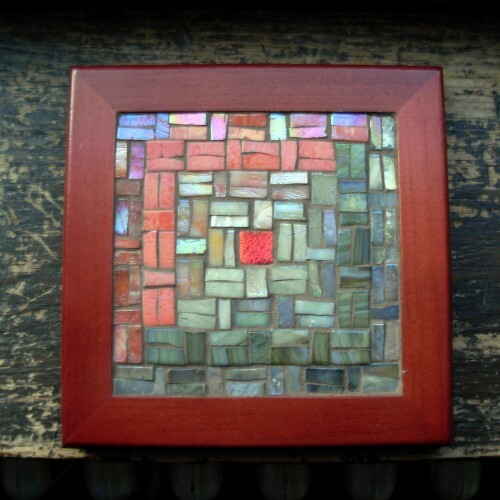 Log Cabin Quilt Trivet in Coral and Cream by Margaret Almon, glass on wood, 6×6 inches, $57. SOLD. Stratoz created a festive 21 Days of Free Shipping on 21 of our creations. 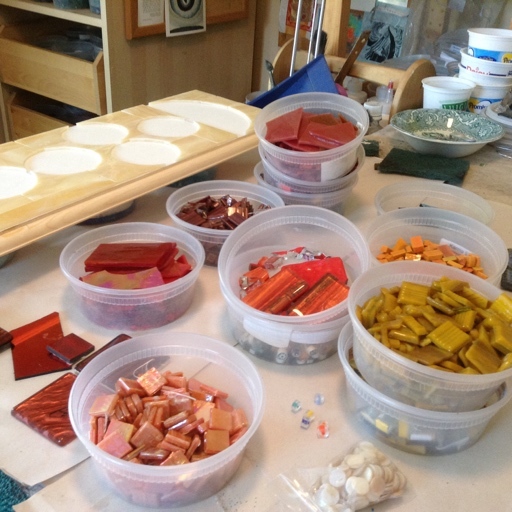 Fortunately, some of them are orange, including one of my quilt inspired trivets, a jazz inspired suncatcher and a blue spiral through the orange desert in mandala form. Click on any of these photos to go to the listing and order. December 15th is the last day to participate in the free shipping. Jazz Doodle Inspired by Marian McPartland, by Wayne Stratz, SOLD. 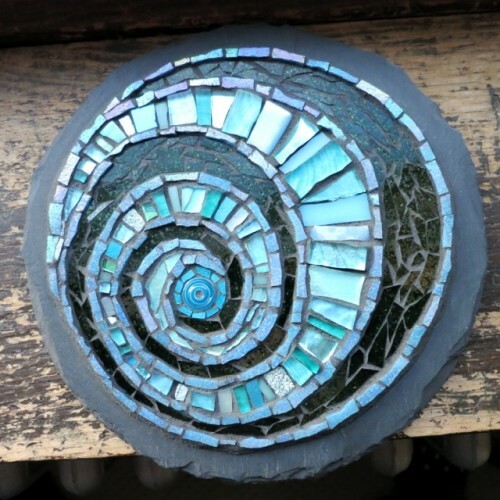 Blue Path Spiral by Margaret Almon. 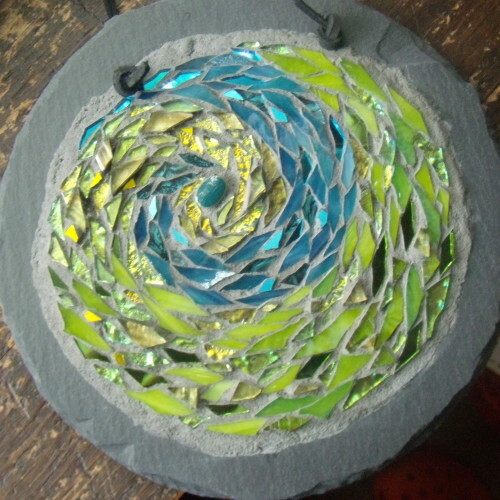 Glass on slate, 9 inches, $162. New Day Mandala(Early Bird and the Night Owl) by Nutmeg Designs. Glass on wood, 10 inches, $258. 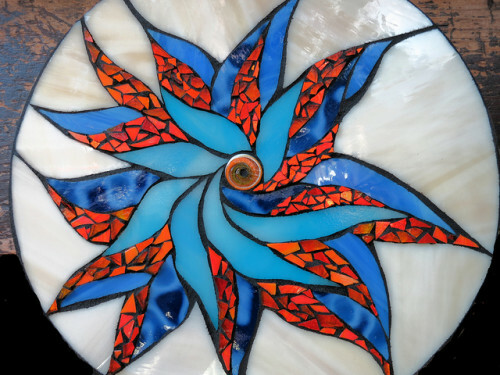 Orange and Blue are opposites that complement each other in this mandala to greet a new day. 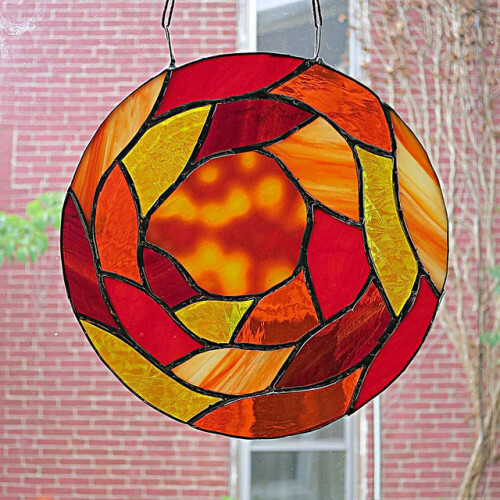 As refreshing as a night of rest this glass mosaic is a circle of hope for being renewed with the rising sun. Designed and started by a blue early bird and detailed by an orange night owl. . . “I like the sunrise ’cause it brings a new day, I like a new day, it brings new hope …”(Duke Ellington/Mitchell Parish) A sign that announces to the world that gravity will not weigh you down, hope is perched on your soul. I am not a morning person, but the sunrise brings this Kurt Elling version of the jazz standard into my head and heart. Elling interweaves a Rumi poem in Mitchell Parish’s lyrics. Take a moment to read the poem and listen to this beautiful tune. 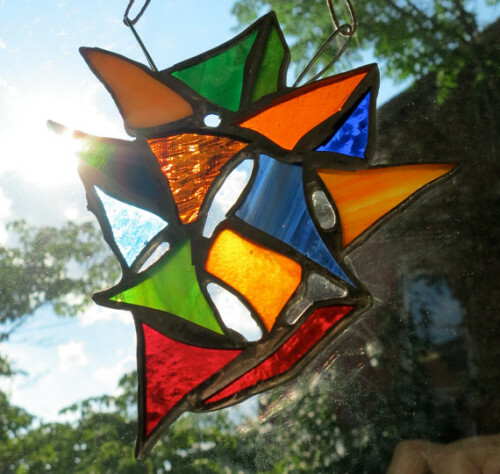 Sheets of stained glass migrate back and forth between my studio and Stratoz’s studio. 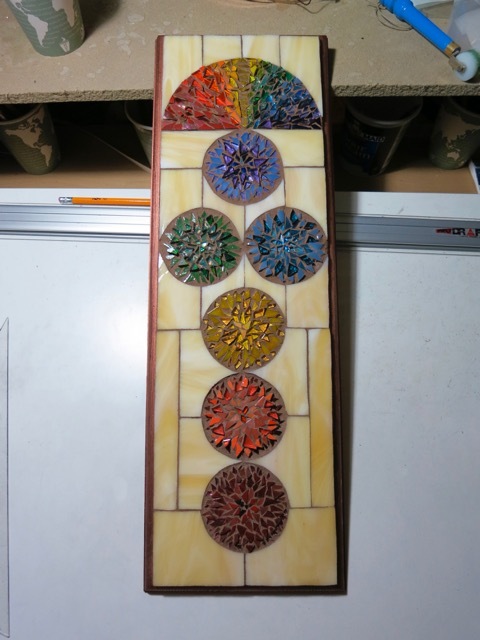 He had a commission for a larger version of his Sophia Spiral, and needed something special for the center. 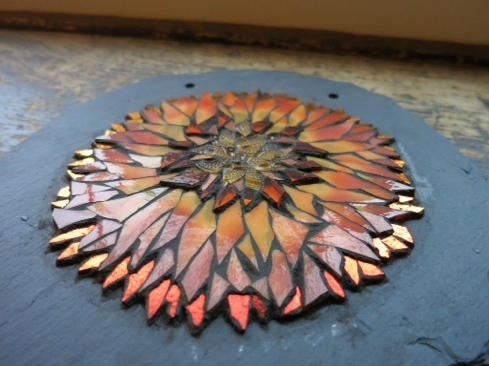 I had some Oceana glass that I used in an Orange Sunflower mandala, with beautiful mottles of yellow and orange. Holding the glass up to the light revealed the yellow like portholes of light. 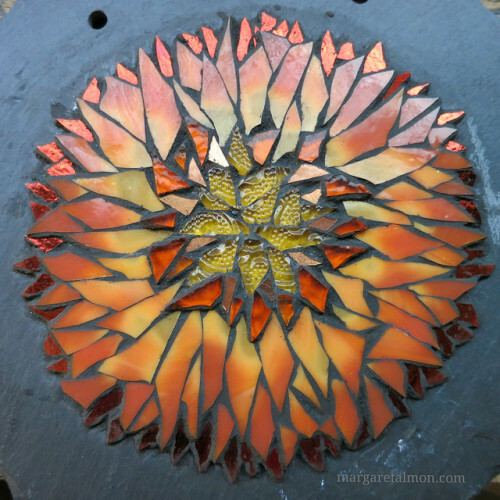 Orange Sunflower Mandala by Margaret Almon. 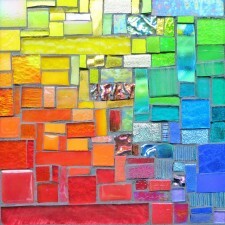 Glass and gold smalti mosaic on slate, 7 inches, ©2015. Blue Tail Comet Mandala by Margaret Almon. Glass and gold smalti on slate, 8 inches. 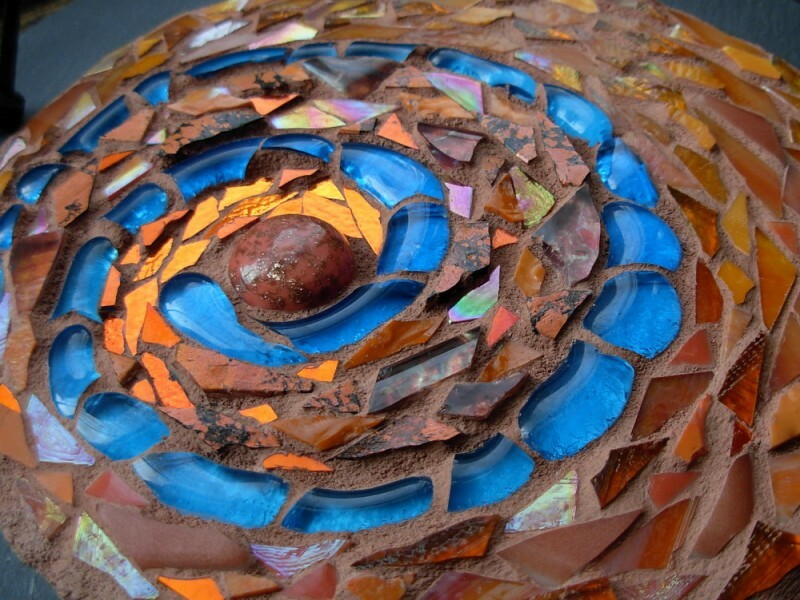 Earth Spiral Mandala by Margaret Almon, glass, ceramic, gold smalti, on slate, 7 inches. Hopscotch #Chakras On the left is pre-grouting. On the right is an image of Margaret grouting. Finished images coming soon. The Grout Monster came over before our open studio. She grouted pendants, picture frames and a house number with ease. Then came the sunflower. The GM removed the painter’s tape after grouting, revealing a berm around the edge. One petal reached past the others and broke through the berm, and she had the inspiration to begin carving the still malleable grout with a blade, tracing all the contours. She thanked me when she was done. She had found it meditative. She asked me what mandala meant. 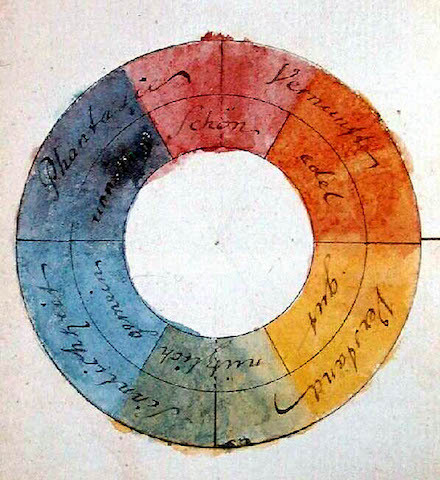 It is a sacred circle. Her stepfather had died that week, and she told me about asking the funeral director to put the chairs in a circle. This was the one thing she wanted, that her family could see each other and tell stories about her stepfather. In her grief, she created intricate beauty, both in the honoring of her stepfather, and in delicately outlined petals.